It's hard to believe that this is the 43rd year that the Center for Creative Youth continues to provide exciting, demanding, pre-professional arts training and personal development to some of this country's most talented and deserving young people. Please update your email and mailing address for our Alumni Association to keep CCY's network strong. Your up-to-date contact information is incredibly important to us. It provides alumni with a network of resources for work or for fun, expands our base of arts advocates, keeps you in the know for Alumni Events and CCY events, such as Open Class Share Day- and gives you the chance to discover old friends and teachers. Click here to fill out the form! 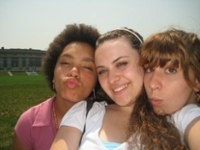 Do you have photos or stories from your time at CCY? Share them with us by emailing ccy@wesleyan.edu. We will add them to our Alumni page here on the website and on our social media sites. We hope to help re-connect you with other members of the CCY family and to inspire the next generation of young artists looking to join. Also, please consider making a donation to the Center for Creative Youth Fund. All funds raised will be used for student scholarships. Your support helps CCY maintain its commitment to the same excellence that you enjoyed those 10, 20, or 40 years ago. "My brother and I are both CCY Alumni. I attended in 2008 and I believe Bobby attended in 2015. My summer at CCY was the best experience of my life. Met so many amazing people and had such an amazing time that I’ve been telling all of my students about CCY hoping they will attend one day. " Michelle's Bio: I was in the filmmaking program during CCY 2008. I received my Bachelor of Science degree in Digital Film & Video Production from the New England Institute of Art in 2013. I’m currently the Production Manager at Saugus Community Access Television in Saugus, MA. 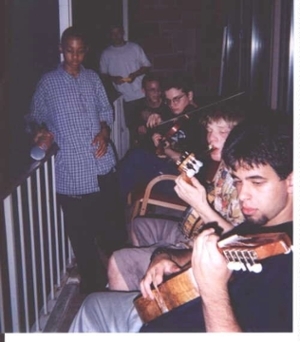 A group of us at CCY would often spontaneously meet in the evenings and jam outside just for fun. Usually someone happened to be playing music and the rest of us would come out to join. In those sessions we learned about other music from each other; riffing on Spanish, jazz, folk and even classical motifs to name a just a few styles. CCY was an awesome experience because the atmosphere fostered a sense of creative-community without judgement. It didn't matter to us kids if you knew music or not. Some musicians actively studied music, some played as a hobby and others had never touched an instrument in their lives. If you wanted to make music you just jumped right in. "Don't have an instrument? Here, borrow mine for a bit!". "Don't know how to play it? I'll show you!"